The Frostweed, Verbesina virginica, is an easy-to-grow native Texas plant with dark green leaves and white, autumn flowers. 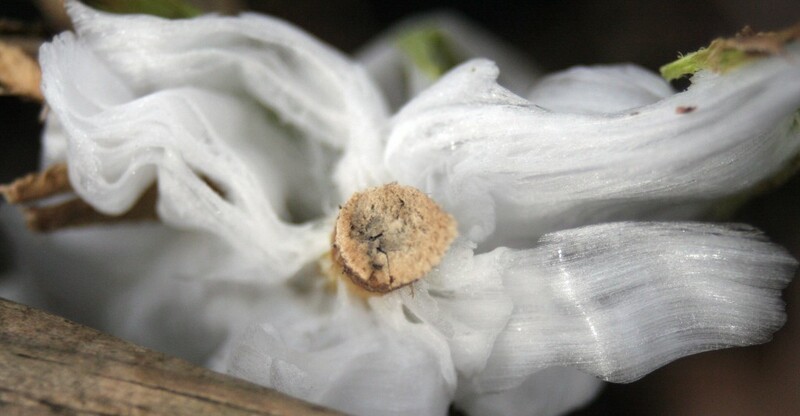 The flowers consist of white discs with dark purple-brown anthers. Gardeners looking to attract pollinators will absolutely love his plant! Many butterflies including the Pipevine Butterfly, Monarch and Great Purple Hairstreak love the bountiful nectar of the Frostweed. The Frostweed is under the Monarch Watch because of its importance as a nectar source for the Monarch butterfly. Fun Fact: When winter brings the first frost of the year, the stems ooze water and sap that freeze into fascinating mini ice sculptures, hence the name Frostweed. Along with the Liatris (read our blog about Liatris here), it is one of the few plants that will bloom in the late summer. The flowers come in beautiful, nectar rich white clusters and they will continue to bloom until the frost. The Frostweed prefers dappled shade where it can form sizable colonies, like at the edge of a woodland or just under a large tree. Plant your Frostweed in a naturalized area where it can get dry to moist soil. It will grow from 2’-6’ tall with little to no maintenance, irrigation or pest control. If you plant it in a dryer and sunnier space you will tend to get smaller and more compact bushes with more flowers. If you plant it in a shady area you will likely get a taller and more leggy Frostweed.